The WHO ColIaborating Centre for Leishmaniasis at the Instituto de Salud Carlos III, Madrid and the Drugs for Neglected Diseases initiative, Geneva have joined efforts to co-organize the WorldLeish-6 Congress. On behalf of the WorldLeish Committee, it is a great pleasure and privilege to invite you to the WorldLeish-6 Congress to be held in Toledo, Spain, from 16 to 20 May 2017. Previous WorldLeish Congresses have been held in Istanbul (1997), Crete (2001), Palermo (2005), Lucknow (2009), and Porto de Galinhas (2013). The Scientific Programme of the upcoming Congress will address issues ranging from molecules to disease control, with the patient as the main focus. The agenda will feature contemporary lectures, hot-topic sessions, and satellite symposia covering the latest developments on leishmaniasis. The educational programme of the Congress will strike a balance between the needs of basic research and clinical issues. We are taking great care in designing a programme that caters to young scientists through fostering scientific exchange, presentations, awards, and social activities. The cultural programme also promises to be appealing, and will highlight Toledo's fascinating culture and history. Successively a Roman municipality, the capital of the Visigoth Kingdom, a fortress of the Umayyad Emirate of Cordoba, and once the capital of Spain under the Emperor Charles V, Toledo is unique. In 1986, Toledo was made a World Heritage City by UNESCO. The city has made remarkable contributions to humankind, namely, the Councils between the IV and VIII centuries with definitive implications for the history of Spain and Europe; the creation and work of the Toledo School of Translators in the XII and XIII centuries, opening Europe to the values of the Neo-Plato Aristotelianism, and hosted the dramatic and expressionistic paintings of El Greco (Crete,1541-Toledo, 1614). The Spanish hospitality and cuisine are even more remarkable in the city of Toledo, which is Spain’s gastronomic capital of for 2016. Its close proximity to Madrid facilitates access from the international airport, but also provides many opportunities for pre- or post-congress visits to the capital. Other UNESCO World Heritage cities like Avila, Segovia, Cuenca, or Salamanca are less than 200 km from Toledo. The brand new ‘El Greco Congress Conference Centre’ has all modern facilities and is five minutes from the historical landmarks of Toledo. More than 4000 rooms in all category hotels are at a walking distance to the congress centre, most hotels offer a friendly environment for socializing in the evenings. The School of Translators was not created by chance: for more than two centuries, Toledo offered an environment of peaceful coexistence among Christians, Muslims, and Jews, attracting intellectuals that made the city flourish. Since then, Toledo became known as ‘the city of three cultures’, and the title remains to this day. Next year Toledo will continue in this spirit as, with the WorldLeish-6 Congress humbly contributing to a better world by providing an international forum for sharing scientific values, knowledge, and research for the benefit of patients around the world. Indeed, during WorldLeish-6, Toledo will be true to its multicultural spirit of knowledge and understanding. Once again, on behalf of the Instituto de Salud Carlos III, the Drugs for Neglected Diseases initiative and of the Organizing Committee, we would like to invite you to WorldLeish-6 Congress. We sincerely believe that you will enjoy both the scientific and cultural aspects of the programme, and the pleasure of springtime in Toledo. We look forward to personally welcoming you to Toledo in May, 2017! 1.1 Transcriptome profiling of Leishmania mexicana life cycle stages. 1.2 New insights into Leishmania donovani stage-specific expression and phosphorylation using a systems-level approach. 1.3 A network of cap-binding proteins and their interacting partners modulate adaptation to different stress conditions in Leishmania. 1.4 Integrated analysis of the transcriptome of Leishmania donovani and macrophage host cell upon infection with antimony-resistant and antimony–sensitive strains. 2.1 Treatment of VL: the African case. 2.2 Current knowledge and needs for VL treatment in Brazil. 2.3 New insights into the exposure-response relationships for miltefosine in the treatment for VL. 2.4 Perspectives for improved treatments on VL. 3.2 Leishmania in the sand fly and determinants of infectivity of sand fly bite and subsequent pathology. 4.1 RNA-binding proteins as major regulators of the Leishmania response to intracellular stress and amastigote differentiation. 4.2 Dominant positive and dominant negative genomic screens for drug resistance studies in Leishmania. 4.4 Direct sequencing of Leishmania genome in biological samples. 5.1 PKDL an overview of clinical aspects. 5.2 Special forms of PKDL. 5.3 Advances in understanding of immunobiology of PKDL. 5.4 PKDL insights in transmission. 6.2 Risk factors for VL and predictors of relapse after treatment in VL. 6.3 Cost-effectiveness analysis of introducing new diagnostics for cutaneous leishmaniasis. •	Applied research at the WHO Collaborating Center of Leishmaniasis, a 20 years endeavor. •	Basic research at the CSIC. •	Clinical research & international cooperation. •	Canine leishmaniosis research at the University. Juan José Montero: Organ of the Tabernacle Chapel. Pablo Márquez Caraballo: Emperor’s organ. Patrizia Salvani: Organ of the Tabernacle Chapel. Atsuko Takano:Organ of the Tabernacle Chapel. Atsuko Takano: Organ of the Tabernacle Chapel. Pablo Márquez Caraballo: Emperor´s organ. Juan José Montero: Echevarría organ. 7.1 The signaling pathway that initiate Leishmania differentiation. 7.2 Phagosome remodelling by Leishmania. 7.3 Leishmania iron acquisition and utilization within host macrophages. 7.4 Leishmania uses mincle to target an inhibitory itam signaling pathway in dendritic cells that dampens adaptive immunity to infection. 8.1 Challenges and progress toward a simple point of care diagnostic test for Visceral Leishmaniasis in East Africa. 8.2 RDTs and diagnostic algorithms in the management of persistent fever syndrome in VL endemic areas. 8.3 Development of prognostic serological biomarkers for visceral leishmaniasis and their relevance to disease control. 8.4: The diagnostic challenges and needs in the kala-azar elimination programme in South Asia. 9.1 Biomarkers of infection and disease. 9.2 Xenodiagnosis and proxies for infectiousness. 9.3 Leishmanin skin testing versus interferon gamma release assays. 9.4 Leishmanin skin testing versus interferon gamma release assays in visceral leishmaniasis patients. 10.2 The role of M2 dermal macrophages in the pathogenesis of chronic cutaneous leishmaniasis. 10.3 Dendritic cell subsets in Leishmaniasis. 10.4 Inflammatory monocytes play a critical role in pathogenesis of visceral leishmaniasis. 11.1 HIV-VL co-infection in Africa. 11.2 HIV-VL co-infection in Asia. 11.3 Solid organ transplants and leishmaniasis. 12.2 New parasites and new vectors. 12.3 Sand fly transmitted Leishmania exosomes: impact on cutaneous leishmaniasis. 12.4 From metacyclics to retromonds: A new stage in Leishmania development within the sand fly midgut impacts vectorial capacity. 13.1 Microbiome, antimicrobial peptides and Leishmania inside the sand fly. 13.3 The Leishmania virome and its role in disease severity. 13.4 Leishmania, innate immunity and microbiome interface as leitmotiv for leishmanicidal compounds. 14.1 The A to Z of drug discovery for visceral leishmaniasis. Kevin Read. Drug Discovery Unit. 14.4 Discovery and optimisation of a new class of potent antileishmanial compounds and determination of their mechanism of action. 15.1 New estimates of leishmaniasis incidence in selected high burden countries. 15.2 Re-emergence and outbreaks of VL. 15.4 Tools for rapid assessment of VL outbreaks. •	Efficacy of Thermotherapy to Treat Cutaneous Leishmaniasis: A Meta-Analysis of Controlled Clinical Trials. •	Treatment of displaced populations or in conflict areas. •	The Immunology of a Healing Response in Cutaneous Leishmaniasis Treated with Localized Heat therapy. •	Thermotherapy plus Miltefosine for the treatment of cutaneous leishmaniasis. Organized and sponsored by WL6, Inesfly and Mundo Sano. Chair: Rajib Chowdhury. National Institute of Preventive and Social Medicine (NIPSOM), Bangladesh. •	Insecticide resistance in sand flies. •	Challenges in vector control for the kala-azar elimination and post-elimination era in India. 08:30-09:30 Can VL be eliminated in the Indian Subcontinent? Can VL be eliminated in the Indian subcontinent? 16.1 Leishmania-neutrophil crosstalk impacts the T cell response. 16.2 Interactions between Leishmania and cells of innate and adaptive immune responses. 16.3 Identification of protective Leishmania-specific CD4+ T cells: implications for vaccine design and vaccination strategies against leishmaniasis. 16.4 IL-17 is associated with protection in human visceral leishmaniasis. 17.1 Exploiting the human anti-alpha-Gal response for the diagnosis of Old World cutaneous leishmaniasis. 17.2 Role of molecular tools in clinical management of cutaneous leishmaniasis: diagnosis, species identification and parasite quantification. 17.3 Evaluation of PoC tests for CL diagnosis in Afghanistan. 17.4 Minimally invasive microbiopsies: a novel sampling method for identifying asymptomatic potentially infectious carriers of Leishmania donovani. 18.1 Experimental strategies for intercepting sand flies to prevent them from reaching and entering homes. 18.2 A new approach in the control of Lutzomya longipalpis s.l. in Brazil Reginaldo Brazil. 18.3 Novel methods of control of visceral leishmaniasis vectors in East Africa. 18.4 Integrated vector management for the control of wild sand fly populations associated with animal facilities. 20.1 Current recommendations for treating CL worldwide. 20.2 CL treatment: clinical developments. 20.4 Harmonised clinical trial methodologies for CL. (21) What´s new on reservoirs? 21.1 Updates on reservoirs of American leishmaniasis. 21.2 The role of bats as reservoirs of leishmaniasis. 21.3 Potential reservoirs in Mediterranean leishmaniasis. 22.1 Pathways involved in the outcome of Leishmania infantum infection. 22.2 Cytotoxic CD8 T cells in the pathology of leishmaniasis. 22.3 Neutrophil phenotypes in human leishmaniasis. 23.1 Thermotherapy in the treatment of CL. 23.2 Clinical experience using cryotherapy for CL. 23.3 Evaluation of the antileishmanial effects of natural products (plants) extracts. 23.4 Clinical experience using herbal medicine for CL. 24.3 Leishmaniasis control programme in the WHO European region. 24.4 Epidemiological analysis of deaths by visceral leishmaniasis in the Americas: challenges for public health. Organized by Mundo Sano and DNDi and sponsored by Mundo Sano. Expected Outcome: to deliver an article that could be disseminated in the different journals just before the congress. Over the past decade there has been progress in the treatment and pre-clinical development of drugs for visceral leishmaniasis. In contrast, many parts of R & D for cutaneous leishmaniasis have been left behind. One part of the CL pathway has received attention, namely the design and analysis of clinical trials. But where are the new drugs to enter the clinical trials? This session will focus on potential routes to take new drugs and treatments from discovery to clinical trials. It will examine the relevance and use of assays and models for evaluation, the value of PK PD analysis, systemic and topical formulations, and roles for immunomodulatory, combinations and re-purposing. Regulatory issues will also be considered. Outcomes will include (i) a consensus document for publication and (ii) an understanding by participants of how better to work together to bring new drugs forward. 14:00-15:30 31 Delivery Systems for Drugs and Vaccines 32 Drug Resistance 33 Canine leishmaniosis: where do we stand? (33) Canine leishmaniosis: where do we stand? 33.1 The utility of Rapid Diagnostic Tests in the clinic and in the field. 33.2 The impact of treatment on dog infectiousness. 33.3 Are prevention and control strategies working? 33.4 New marker for the diagnosis of visceral leishmaniosis in asymptomatic dogs. •	Epidemiological aspect of the outbreak. María Ordobás. Servicio de Epidemiología, Comunidad de Madrid. 34.1 Methodology and study design. 34.3 From clinical trials to access. 34.4 Progress of approval of clinical trials. 13.2 Leishmania-Phlebovirus co-infections in sand flies, dogs, and humans. 21.2 The role of bats as reservoirs of leishmaniasis. Cáris Maroni Nunes. Over the past decades there has been progress in the treatment and pre-clinical development of drugs for visceral leishmaniasis. In contrast, many parts of R & D for cutaneous leishmaniasis have been left behind. One part of the CL pathway has received attention, namely the design and analysis of clinical trials. But where are the new drugs to enter the clinical trials? This session will focus on potential routes to take new drugs and treatments from discovery to clinical trials. It willexamine the relevance and use of assays and models for evaluation, the value of PK PD analysis, systemic and topical formulations, and roles for immunomodulatory, combinations and re-purposing. Regulatory issues will also be considered. 29.2 Clinical Characteristics and Treatment Options for MCL, DCL and DL patients. 32.2 Resistance to drug combination therapy in Leishmania. Francisco Gamarro. · Epidemiological aspect of the outbreak. María Ordobás. Servicio de Epidemiología, Comunidad de Madrid. To accompany this major event, the WL6 Scientific Community, in partnership with PLOS Neglected Tropical Diseases and PLOS ONE, call for research papers to be submitted for consideration for a WorldLeish-6 Collection. The WL6 Scientific Committee has identified a series of major topics that will provide the background to the main scientific sessions during the congress, and the organizers would like to celebrate a Jubilee of Leishmaniasis by inviting the scientific community to submit papers addressing "hot" topics within the major areas selected. Drs. Jorge Alvar and Javier Moreno (chair and co-chair of the WL-6 conference respectively) will act as the PLOS Collection Curators and as such will choose the articles to be included alongside their accompanying editorial. Submissions can be made to PLOS Neglected Tropical Diseases, PLOS Pathogens ► or PLOS ONE ► . Those articles which are accepted for publication will be included in a rolling collection on Leishmaniasis – papers will not be held for coordinated publication, as PLOS and the WL6 Scientific Committee do not want to delay the release of important research in this field. From those papers accepted to the collection, DNDi will award prizes to 20 researchers at WL6. The WL6 Scientific Committee will decide which papers receive the prizes, which are intended to help fund the publication of future research in this field. The Toledo Congress Centre is just 70 km from Madrid (Spain). It is the perfect setting for your events, right in the historical centre of Toledo. The nearest airport to Todelo is Madrid Barajas International Airport (MAD). Toledo it is very close to Madrid (70 Km) and Barajas International Airport (80 Km). In just 50 min. you can get to Toledo by motorway from Madrid Barajas International Airport, taking the M-40 or A-42 (Highway Toledo). GPS: 39.861988º N , 4.017735º W.
Twenty-two fast trains (AVE) daily link Toledo with Madrid (Puerta de Atocha) in just 25 minutes, communicating with the other national fast speed lines and international rail lines. IBERIA L.A.E. as preferred air carrier of 6th CONGRESS LEISHMANIOSIS by virtue of the reached agreement, will grant a 10 % discount to the assistants to the congress. With large gardens, magnificent views of the historic city center, a huge terrace with outdoor pool, free Wi-Fi and free parking, Cigarral El Bosque Hotel welcomes you to Toledo, a World Heritage Site. 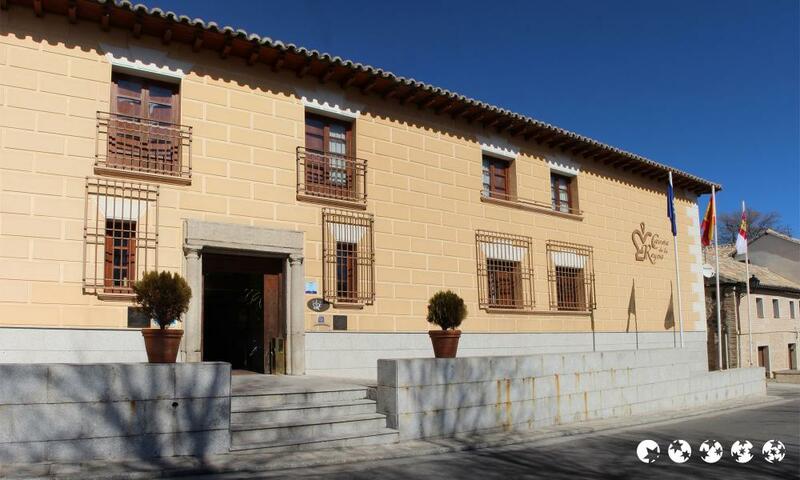 Located in one of the oldest mansions of the region, this modern building, opened in 2004, occupies one of the most prestigious Cigarrales area, just minutes from the beautiful historic center of the imposing capital of Toledo. The rooms feature modern, functional, friendly, bright décor noted for playing with history itself; small rustic touches are the basis of their fragrance in a simple canvas without unnecessary ornamentation, just a good combination of colors on the walls are sufficient to achieve a warm and out of the sheets weather. Spacious and well-armed, equipped with air conditioning and heating with adjustable thermostat, TV and WiFi internet access. Some enjoy beautiful wrought iron balconies enjoying the low valley of the Tagus, some love for their sloping ceilings painted indigo manchego. In an atmosphere where past and present mistakes, is the Hotel Carlos V. A landmark building, full of history and stories to tell, perfect for those wishing to explore the city or attend meetings and conferences. The Hotel Carlos V has its own viewpoint, outdoor terrace from which you can see the whole city. A unique setting in which to savor gourmet dishes under the watchful eye of an ancient city. The Sercotel Pintor el Greco is a comfortable and welcoming 4-star hotel in Toledo situated in the historic center of the city; in a declared interest by UNESCO in which you will find the Jewish Quarter area, the House of El Greco and the Cathedral. The building is covered with wireless Internet access. Modernity and tradition meet at the Hotel Toledo Auditorium & Spa **** Beatriz Hotels offered in Toledo, one of the most beautiful cities in the world to be declared a World Heritage Site, rich in history, culture and gastronomy. This modern continental style, is located 5 minutes from the old town of Toledo 7,000 m² of gardens and an outdoor pool. 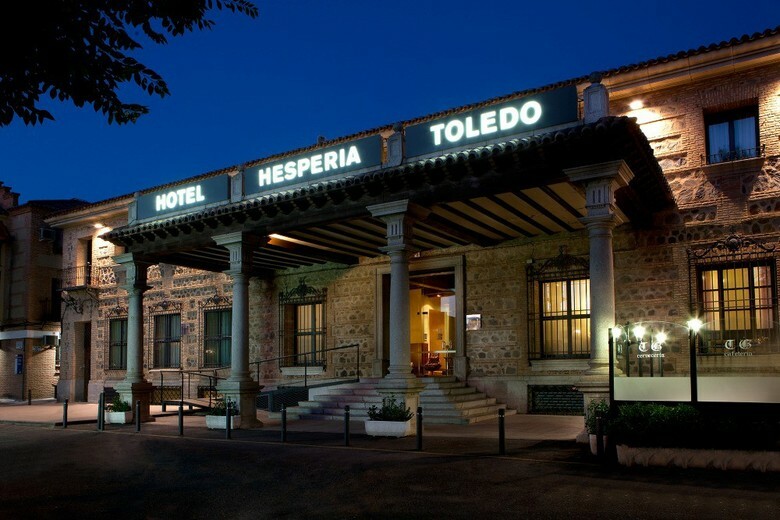 The Hesperia Toledo is just 500 meters from the walled city center, opposite the bullring. The hotel is a traditional Toledan building was renovated in 2006 and features a large patio covered by an impressive glass dome. Also it has WI-FI and minibar. The restaurant offers breakfast buffet every day and there are restaurants in the area for lunch or dinner. The Eurostars Toledo, avant-garde design, is decorated with contemporary art. 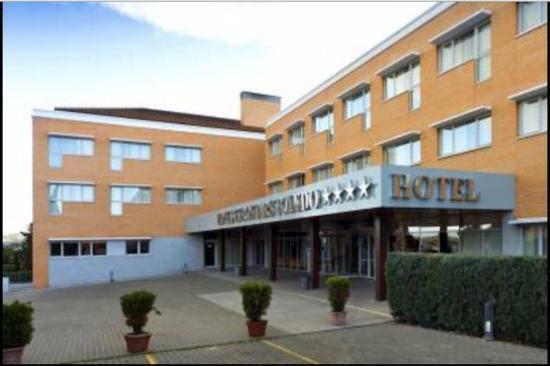 Located in the economic and financial area of Toledo, is a workspace first level: free WiFi around the perimeter, Business Corner, spacious rooms with a desk and spacious meeting rooms which hold work sessions in the capital of La Mancha with all kinds of facilities and technical equipment. At the same time, the Eurostars Toledo is a privileged place for your leisure, outdoor swimming pool, gardens and located one kilometer from the historic city center. The AC Hotel Ciudad de Toledo has a privileged location in a beautiful area near the Tagus River, with a stunning panoramic view of Toledo, city considered by UNESCO as World Heritage. To enjoy maximum comfort, we offer Internet service to wireless high-speed Internet access in public areas. Hostal Toledo is one of the best accommodations to stay in the city, thanks to its good location and a friendly, familiar and close atmosphere. It enjoys a privileged location, in a quiet area outside the old town, which takes you just 10 minutes walk to downtown. With a warm decor, it’s a cozy and comfortable place, whether you choose to enjoy the holiday tourism or do business. 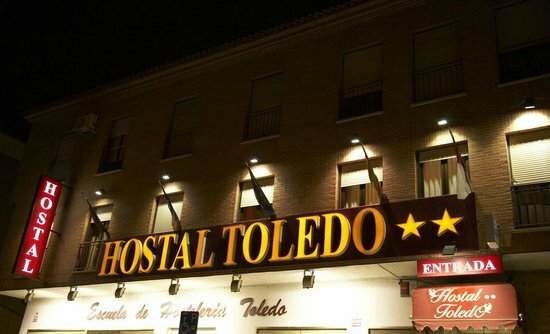 Hostal Toledo offers full services including 24 hour reception, free Wi-Fi throughout the hostel, coffee-bar and a social lounge. Guests will find 26 comfortable non-smoking rooms with complete bathroom, among other services. Hotel Alfonso VI, 4 stars, presents a host of top class services, with special attention to the customers and a perfect location in the historic city of Toledo. The hotel has a privileged location in the city of Toledo, in the heart of the historic center, opposite the Alcazar, next to the Cathedral and the New Congresss Palace. With a purely Castilian style, many of our rooms have two beds (twin), spacious and stately, combining stone and wood to give warmth and comfort to our customers. All rooms have marble bathrooms and great views from the top of the city to the most important monuments and Los Cigarrales with wonderful sunsets. This brand new, small hotel is located in the cultural heart of historic Toledo. Hostal Palacios provides comfortable and convenient accommodation in this impressive city. Air-conditioned rooms are decorated in a warm, rustic style and feature plasma-screen satellite TVs and views of Toledo’s old town. The property also has its own internet point, which you can use to plan your trip to the magnificent Alcázar and other local attractions. After a day’s sightseeing you can return to enjoy the delicious traditional cuisine served in the adjacent Restaurant Palacios. 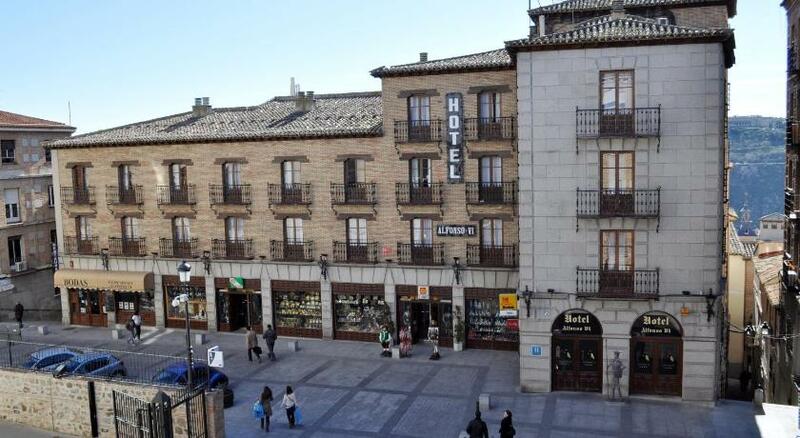 Hotel Mayoral, located just in front of the bus terminal, 200 m from Puerta de Bisagra and a 2-minute walk from the escalators to Zocodover Square, is centrally located in Toledo.The hotel has 110 rooms, many of them with terrace and views of the city. All rooms come with a flat-screen TV, desk, and a bathroom with a bath, shower, and hairdryer.The hotel has eight meeting rooms and a restaurant and many companies have used for meetings or training days, because they know that the last detail will be taken into account for a successful day. 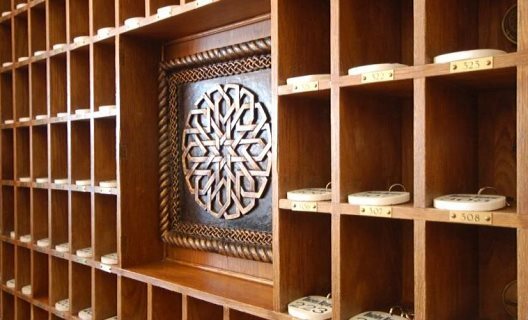 Housed in a building dating back to the 15th century, this magnificent hotel boasts impressive architecture and Castilian-style interior decor. This hotel is located between the Tavera Museum and the bullring.From Hotel Maria Cristina you can stroll into the heart of the city, and wander through the historic streets. Visiting the famous Toledo Cathedral is an absolute must. Enjoy a tasty meal in the hotel’s restaurant, where you can combine a 3-course meal with a bottle of the finest regional wine. At the end of a long day, the elegant rooms are the perfect place to relax. They come with Wi-Fi internet access and en-suite bathrooms. 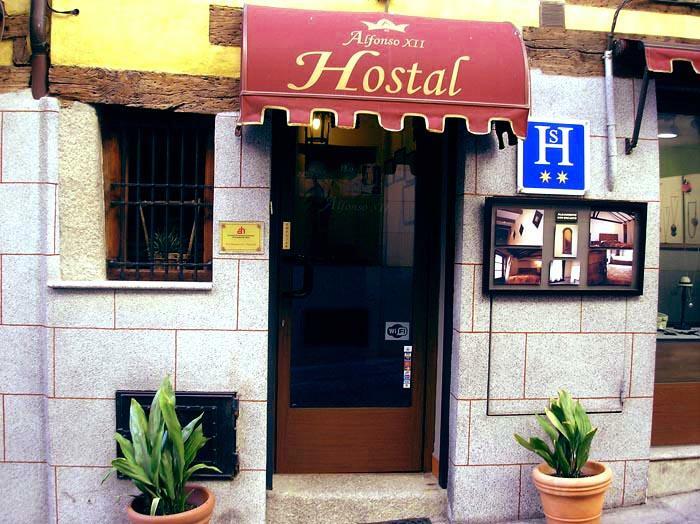 Hostal Alfonso XII is a cozy hostel located in the tourist center of Toledo, next to the synagogues, Greco Museum, and near the Cathedral, the Plaza de Zocodover and the Alcázar de Toledo. There is free Wi-Fi internet. All rooms have a private balcony. Rooms are air conditioned and heated. There is a glass shower in the en suite bathroom. The Hotel is situated in the centre of Toledo, next to the famous Alcázar castle. This hotel features rooms with balconies and free Wi-Fi access throughout. Rooms at the Toledo Imperial are spacious and offer traditional décor with terracotta floors. Rooms have satellite TV and air conditioning. The Imperial is set close to several of Toledo’s restaurants and bars. The hotel is just 200 m from the city’s cathedral. Toledo Railway Station is approximately 10 minutes’ walk from the hotel. The high-speed AVE train connects Toledo to the centre of Madrid in 35 minutes. This hotel is set in a historic building located between Toledo’s ancient city centre and the quiet, natural area around the River Tajo. Built on the foundations of a 16th-century townhouse, the Sercotel Casona de la Reyna retains many historic features, such as its centuries-old oven and cistern, fountains and fireplace. These features are now complemented by modern facilities, such as Wi-Fi internet, and fine decor throughout. 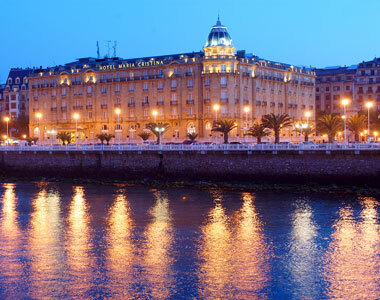 Before sightseeing in this authentic Castillian city you can enjoy the hotel’s buffet breakfast. In the evening, you can return to relax by the fireside in the comfortable lounge area. The Hotel is located right in the old quarter of Toledo, a short walk from the emblematic Plaza de Zocodover. 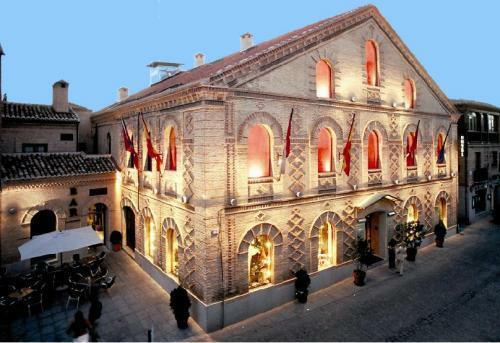 Set between the Puerta de Bisagra and Puerta del Sol, within the old city walls, the Hotel Real de Toledo is a charming, historical building. The classical exteriors and interiors, renovated in 2009, contrast with facilities such as free Wi-Fi and full air conditioning. There is also a breakfast room. In order to make the WorldLeish 6 Congress as accessible as possible to people from resource-limited settings, and in a bid to support the professional development of a new generation of scientists from endemic countries in the fight against leishmaniasis, the 100 STUDENTS INITIATIVE PROGRAMME will provide financial assistance to help people who would otherwise be unable to attend because of travel and registration costs. Even though every attempt will be made to assist as many applicants as possible, we regret that there were only a limited amount of scholarships available. The programme will support the costs for between 80 and 120 eligible participants from all continents, particularly those coming from low- and middle-income countries. Successful applicants will receive financial support for travel and/or accommodation costs and will also benefit from registration to the Congress. Those eligible for 100 STUDENTS INITIATIVE PROGRAMME Initiative include students and young scientists (less than 35 years of age) whose abstracts are accepted as first author for WL6 and that can demonstrate the need for financial support in order to attend the Congress. Curriculum vitae: The CV should be 2 pages maximum and include qualifications, key papers or research topic, main supervisor (if applicable) and title and number of accepted abstract (this number is given automatically when the abstract submission process is completed). Students: Students must prove their status by providing a copy of a certificate issued by the institution where they are enrolled. Post-doc students must prove there is no contractual relationship with their institutions in order to benefit from a student status. Motivation letter: A one page document where the applicant should explain the reasons why he/she hopes to attend the congress, how their organisation will benefit from their attendance and demonstrate the financial need. Letter of recommendation: This is a one-page recommendation letter written by the research supervisor, mentor or teacher. This letter must be reviewed and approved by the candidate´s institution. A 100 STUDENTS INITIATIVE PROGRAMME review committee composed of members from DNDi and ISCIII, the two institutions organizing the WL6 Congress, will review applications. The WL6 chair and co-chair, the WL6 organizing committee, the event coordinator and the directors of DNDi´s regional offices in Asia, Latin America and Africa will be part of the committee. Candidates will be selected based on their professional career, country of residence and/or work, institution or organization funding the candidate´s research, candidate´s political and social context and personal circumstances. A balanced gender and geographical distribution of grants is a key element of 100 STUDENTS INITIATIVE programme. Applications will open on 15th October 2016 and end on 15th January 2017 Selected candidates will be contacted individually by the end of January 2017. Their names and countries will be published as part of the Congress information pack. Leishmaniasis Jubilee Activities have been organized around the congress by the WorldLeish6 Organizing Committee.Four activities have been scheduled which aim to bring a greater awareness of leishmaniasis to the general public. A Special Session at the Spanish Royal Academy of Medicine Madrid (RANM) on “Violence and Leishmaniasis” will be broadcasted on May 22nd, 2017 from 18:00 - 20:00 to all Spanish speaking countries in the Americas. The epidemics in South Sudan, Colombia, Middle	East, and Syrian refugee camps will be reviewed in the context of war and civil unrest. This Special Session will be chaired by Prof G Piédrola, a member of the RANM, and Dr J Alvar, President of WorldLeish6 and correspondent member of the RANM. Dr J Postigo (WHO),Dr K Ritmeijer (MSF), Prof Iván DVélez (PECET, Colombia), and Dr A Cowley (Mentor Initiative) will be speaking at the event. An Exhibition on Leishmaniasis at the National Natural History Museum in Madrid will display simple diagrams, photographs, and 3D models	to explain the biology of Leishmania and the sandfly. The exhibition will also feature an explanation of the biological life cycle of leishmaniasis and an informative article on “Leishmaniasis beyond your pet” published by Dr J Alvar in NaturalMente, the museum’s online, open access journal. The display will be rolled out in various Spanish provinces for several months following the congress.